Some additional practical resources about getting started with PBL in your classroom are here on my wiki. One very holistic approach that has emerged to put constructivism into action is Project-Based Learning (PBL) which also infuses technology into learning activities in a very natural way. Experts in this field aim to cultivate the life of the child’s mind in a way that develops not only cognitive processes but also emotional, aesthetic and spiritual contexts, as well as social relationships (Katz, 2000). 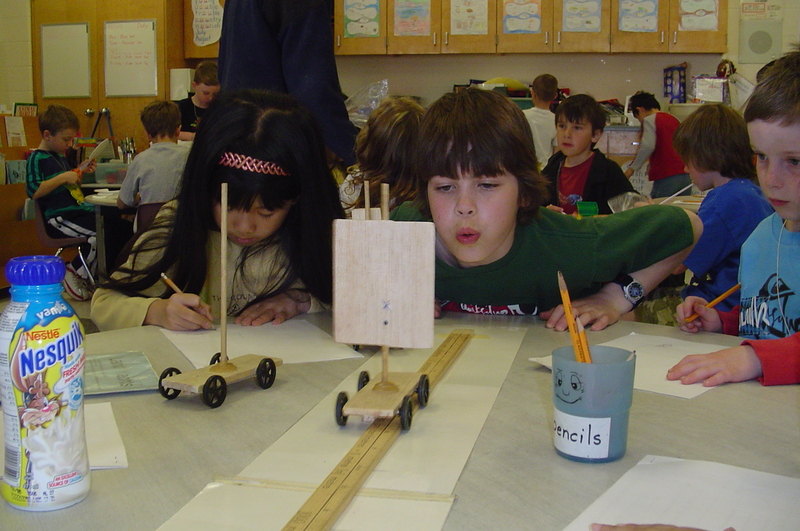 PBL centres around a structure of inquiry that begins with the students’ interests, in collaboration with the teacher. Children make predictions, and investigate through observation, interviews, fieldwork and gathering information from a variety of sources. In the process of gathering information, findings are recorded and shared in an collaborative (usually public) way, with all students accepting responsibility for their part in the discovery process. To me, PBL exemplifies a holistic, bricolage approach since it involves knowing well your students and their community and using a wide variety of available resources (people, technology, knowledge, observations) to explore personally relevant topics deeply. The opportunity to capitalize on multiple intelligences to create diverse working groups and alternate demonstrations of learning is prevalent. http://www.edutopia.org An excellent comprehensive resource for educators demonstrates best practice with PBL and technology. The site includes videos with experts, stories of classroom successes with technology and downloadable resources to help get you started with PBL. http://www.projectapproach.org/ The purpose of this site is to provide an overview of the project approach and how it relates to learning as well as providing online courses, project ideas, resources and links to other project sites. http://www.uoregon.edu/~moursund/dave/Free.html David Moursund is a leading educator in ICT enhanced Project-Based Learning and his website provides lots of background information, mini-courses and links to books, articles and presentations. www.bie.org The Buck Institute of Education provides instructional resources about how to get started in your classroom with PBL and provides a teacher handbook that outlines the process plus assessment techniques and classroom management strategies. http://www.coe.ksu.edu/pbl/ Really good website about both the theoretical and practical aspects of designing and assessing projects. Lots of links to explore further reading. Capra, S., and Ryan, J. eds. (2002) Problems are the Solution: Keys to Lifelong Learning. Capra Ryan and Associates, Brisbane, Australia. Clack, Edward T., (2001) Designing and Implementing an Integrated Curriculum. Holistic Education Press: Brandon, Vermont. Katz, L., and Chard, (2000) Engaging Children’s Minds: The Project Approach. 2nd Edition. Ablex. McGrath, D. (2003, February). Artifacts and understanding. Learning & Leading with Technology, 30(5), 22-24ff. McGrath, D. (2002-03, December/January). Launching a PBL project. Learning & Leading with Technology, 30(4), 36-39.